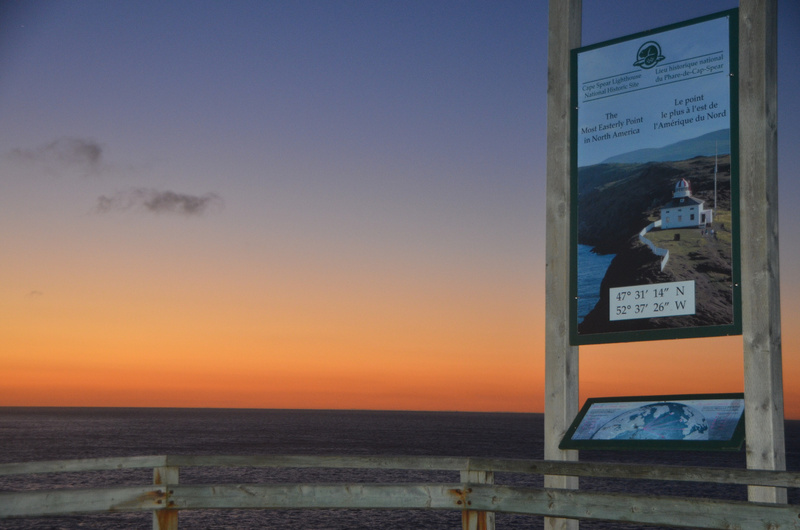 September 24th, 2015 – Cape Spear, Newfoundland – I was the first person in North America to see the sun come up today! 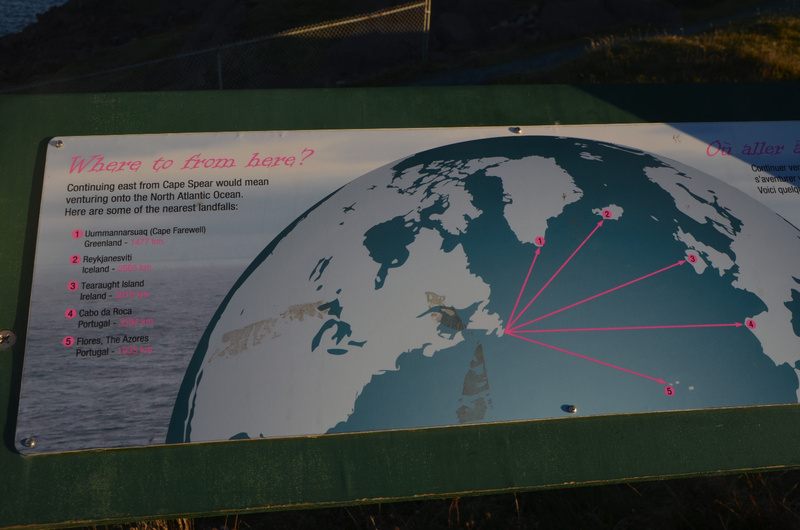 From the furthest east point of land in North America, Cape Spear, Newfoundland Canada. 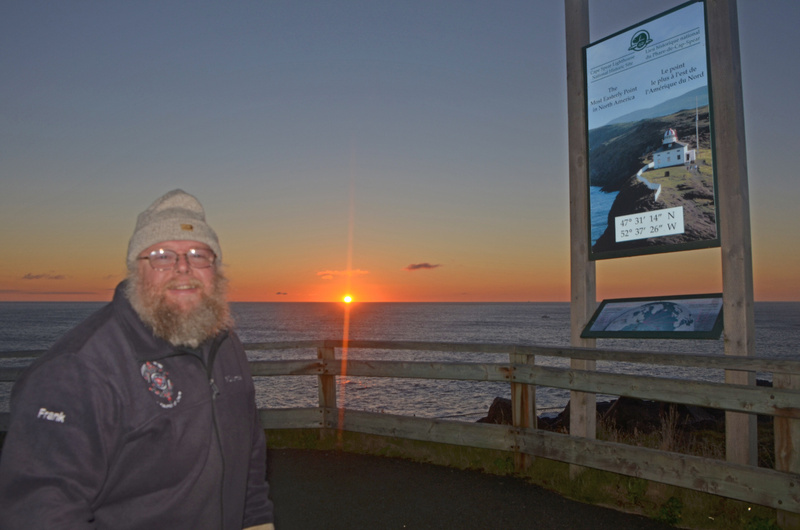 On this second day of autumn, the sun came up over the horizon at about 6:49am (GMT-3:30). 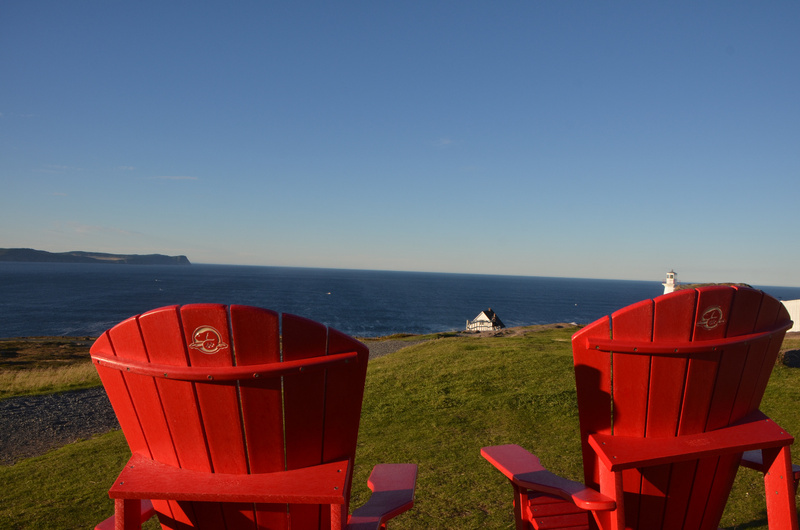 Parks Canada’s “Red Chairs” are really sturdy recycled plastic. Placed strategically for great views in lots of parks, worth taking a break. Parks Canada maintains a National Historic site here. 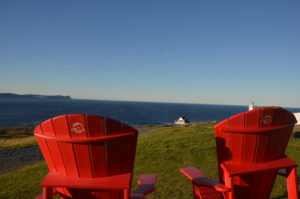 There’s a small parking lot with plenty of front row for folks who like to sit and watch the ocean, plenty of nice trails to wander along the cliffs to see the ocean, and a boardwalk with a bunch of steps heading up to the old and new lighthouses. There is also a World War II gun battery to explore, but I’ve done enough of that back home. The 1835 lighthouse is further up on top of the hill on a flatter spot. It is more of a house than the modern structure. The view from up top is broad in all directions. 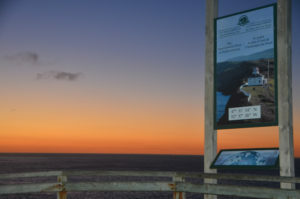 You can see a bit of St. Johns to the northwest, lots of inland forest to the west and south west, but primarily the Atlantic Ocean in all other directions. There are cruise ships passing by, fishing boats large and small. During the summer there are also a lot of whales passing by I’m told. I am about 3,100 miles from home here “as the crow flies” (very tired crow), but only 2,300 miles from London. Time zone is only three and a half hours behind Greenwich compared to Seattle at seven hours behind. I spent a few hours here on Wednesday evening, and went back to St. Johns for dinner. I came back around midnight and stayed in the lot here waiting for sunrise. So this is as east as it gets for a North American Road trip. I drove almost as far north as you can in Alaska, and all the way east here, so next I will be heading south. An appropriate thing to do this time of year, and fall colors should be evident as I do. The new lighthouse. Note the solid rock, this is what you find under the entire island. It is lower down the slope, sturdy enough to stand a few really big waves that tend to show up during storms. The old lighthouse is now a museum. Quite a view from up here. They say the waves have been known to wash up this high on a rare occasion. Parking lot, look for the Trailer. Looking south along the shore. Hard to get a sense of scale here, but it is a small pond. See the plaque on the rock. Soaring on the updraft over the cliff. This soft blanket of grass will probably be covered with snow again soon. The old lighthouse visible here, the new one is down the hill almost right behind. So close! Europe is closer than home. Mild surf (I’m told) you can see the swells approaching land. Nice boardwalks are pleasant to walk on and preserve the relatively fragile grasses.